Bolster the security of your home Wi-Fi network with the D-Fend AC2600 Wi-Fi Router from D-Link. 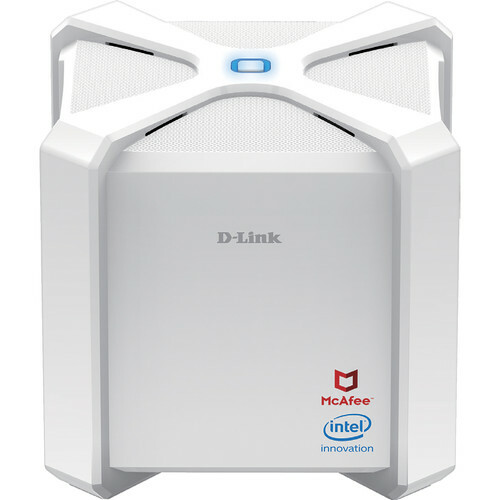 Capable of up to 2533 Mb/s of total wireless throughput, this dual-band Wi-Fi router supports the Wi-Fi 5 (802.11ac) Wave 2 standard, and it boasts a series of McAfee-powered security features and parental controls designed to defend your network from hackers while keeping your kids safe online. The D-Fend AC2600 Wi-Fi Router comes equipped with a Gigabit Ethernet WAN port and three Gigabit Ethernet LAN ports, ideal for wired connections to computers, TV set-top boxes, and game consoles. A USB 3.0/3.1 Gen 1 Type-A port is handy for sharing storage drives, printers, and other USB devices on the network, while multi-user MIMO technology allows for multiple simultaneous data connections. D-Link Smart Connect technology is designed to automatically switch devices to the optimal wireless band. Support for Amazon Alexa lets you control various router features with voice commands. Kick security up a notch with D-Fend security protection for your network. Parental controls help to keep your kids safer online with age-based profiles and the ability to pause the internet when you need to. D-Fend allows you to take control of your devices and be the first to know and respond to potentially threatening activity on your network, such as devices trying to connect to malicious addresses or unidentified devices joining your network. When you are away from home, you can also deny any new devices from connecting to your network. D-Fend also works with Amazon Alexa, ideal for controlling and monitoring your home network with your voice. You can scan your network, block devices, and get up to speed on your network notifications. Get end-to-end protection with the included five-year subscription to McAfee Secure Home Platform, which automatically helps to protect devices connected to your network. A two-year McAfee LiveSafe antivirus software subscription for your computers, tablets, and smartphones is also included. The built-in Quality of Service (QoS) engine allows you to prioritize important traffic to help ensure that your favorite applications are receiving optimal bandwidth. Sharing your internet connection doesn't have to be a complicated process; just download the free D-Link Wi-Fi app for your mobile device and follow the on-screen step-by-step setup instructions. You also have the option to use a web browser to access the setup wizard and manage your router. Support for Wi-Fi Protected Setup-Push-Button Configuration (WPS-PBC) lets you create encrypted connections to new devices simply by pressing a button. In addition, access control features allow you to restrict access to your network, giving you greater control over network users. D-Link's Smart Connect Technology is designed to automatically switch devices to the optimal band, either 5 GHz or 2.4 GHz. Simply initiate a connection to the router and its algorithms will determine the best network for your device to connect to, helping to ensure a faster, more reliable, and hassle-free experience. The USB 3.0/3.1 Gen 1 Type-A port lets you connect a USB storage device and share documents, movies, pictures, and music. Put your music library on a USB drive and share it with your entire home. Show photos on the living room TV while your family watches a movie on their computer. Support for the UPnP protocol lets you discover network devices so you can stream media to multiple devices easily, or save them to your device for offline playback. The intuitive interface lets users connect to a variety of entertainment options stored on your own storage device. Command D-Fend, control various router features, set up a Wi-Fi guest zone, and turn your Wi-Fi on and off using Amazon Alexa voice commands, all without having to go into the UI. Box Dimensions (LxWxH) 16.75 x 13.05 x 8.35"